One man who would know is Marshall Strabala. EVERY COUPLE OF months, you will hear news of another massive building going up somewhere in the world. In architecture, it seems, that height is the latest status symbol – particularly in the Middle East where mega-tall structures are being built or planned to go up (and up and up) over the next decade. But what does it take to create a building like that? Is height the only goal? One man who would know is Marshall Strabala. The American architect has worked with renowned companies such as Skidmore, Owings and Merrill and Gensler and now heads his own firm from offices in Chicago and Shanghai. Among his designs? The world’s tallest building (by height to highest usable floor), the Shanghai Tower. He has also designed the Houston Ballet Center For Dance and the Hess Tower in Downtown Houston. TheJournal.ie spoke to Marshall about his work and his process, which he describes as making function the form (making the building fit or represent its purpose). I do not know who said this, but architecture is a lot like making sausage. If you saw the process, you would stop eating sausage. “The architecture process is different for every firm, and every project. We do rather complex high-profile projects, and therefore we put a lot of time and focus on the quality of the project. “We start every project from the ‘inside out’. That is to say we solve the problem from a functional standpoint and more often than not this leads us to a new formal solution. So if the individual functions of the building can be translated into the image of the building, we have a better chance of something new. Sometimes these little things become what the building is about. We are doing a very large project and there is a ballroom on the sixth floor. This single space can fit 9,300 people. So we need 58 egress stairs, each stair is 48” wide, and these stairs will require about 15,000 square feet. This is equal to about 10 two-bedroom apartments. Using these odd requirements, we can design better buildings. Strabala says that the primary client for any building isn’t necessarily the person handing over the money. He says that the space it will occupy is the most important factor. There are three clients for every building. For our buildings, we start with the city: the first client. The project must benefit the city, be sustainable and also be a good neighbour. Strabala’s own working process involves making scaled-down models to check the building’s fit with its surroundings. He then uses 3D modelling, including Lego for a better view of the project. However, he says all buildings are different. “Each project is unique. In one case, we made the building taller and thinner than the planning requirements allowed, and in another project we placed a majority of the space underground to keep a park-like feeling for the whole area. “A small office building we are doing right now has some very, very restrictive right-to-light issues. This forced us to place the building into one corner of the site and make the tower thinner on each successive floor. Architecture is not fashion, something that changes from season to season, but something that will last 100 years. I see a problem with the education of future architects because the web has made it so easy to look for source materials. As a man who has designed a building that touches the sky, Strabala is keen to point out that there are technically only 17 supertall buildings in the world (those being buildings that reach over 420 metres or 100 storeys of offices). 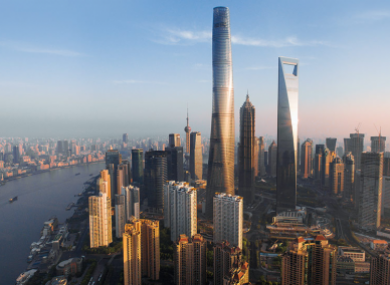 Current regulations in the US mean that buildings are capped at 609 metres, some 23 metres shorter than the Shanghai Tower, which means the US will never again hold the title of world’s tallest building. Strabala also points out that height isn’t everything. I think yesterday the status symbol was a big part of the desire to go tall, but today it is more about the quality of life and we need more tall buildings in the 500ft-800ft range. He goes on to point out the changing role played by cars in US cities, meaning more centralisation and denser buildings and how the big advantage to high-rise buildings is the land they don’t use. While he says that the “ego trip” of building skyscrapers may not go away, most people who think they want one balk at the price. For himself, while he doesn’t pick a favourite of his buildings, Strabala says his favourite project is always his next. Email “The man behind the skyscrapers: 'I have done houses, museums and the world's tallest building'”. Feedback on “The man behind the skyscrapers: 'I have done houses, museums and the world's tallest building'”.